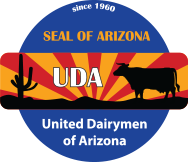 United Dairymen of Arizona and Arizona Cheese Co. recently presented at the Mesa Library, on the 'Art of Cheese Making'. The presentation covered both large scale and small scale cheese making. Expert cheese maker, Tom Wiskerchen covered the basics of cheese ingredients, different types of cheese, large scale equipment, and the importance of high quality milk to start with. During the presentation, UDA Asst. SQF Manager and hobby cheese maker, Saul Lopez was making a batch of mozzarella. The science behind the process is similar no matter what scale you are making your cheese in. Saul encouraged interested home cheese makers to not give up if their first couple batches of cheese didn't turn out perfect. Little tweaks along the way will lead beginners to an awesome product. The presentation ended with samples of cheese from Arizona Farms Cheese and lots of questions for the curious attendees.